Location: Isle of Lewis, Hebrides, Scotland.. Grid Reference: 58° 12' 12" N, 6° 45' 25" W.
Callanish I: (Stone Circle, Avenues). One of the most spectacular megalithic sites in Scotland. The overall design of the monument is similar to the Celtic cross and the cruciform chambers of many Neolithic passage mounds. 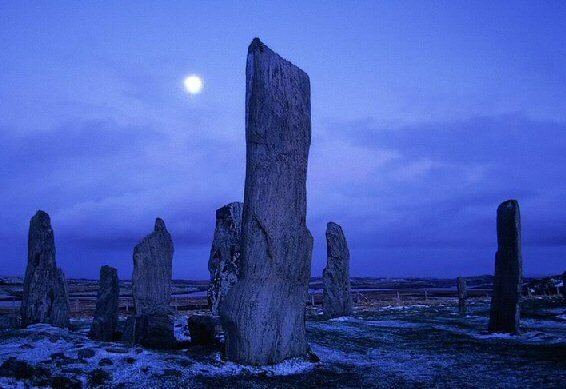 The Callanish-I stone-circle was built so that the moon, at its major standstill appears to rise and set from behind the hills of Harris which are as much a part of the monument as the stones themselves. Callanish has been associated with both lunar and solar astronomy. ('Calanais', 'Tursachen', 'The Place of Mourning/Pilgrimage). The stones vary from around 1 m to 5 m in height, with an average of 4 m, and are of the local Lewisian gneiss. The site centres on a natural peak in the landscape, offering spectacular views all round. Callanish I consists of a 13.1 x 11.3m (43 x 37 ft) circle of 13 gneiss stones. In the centre stands a monolith (4.75m/15 ft 6 in). Four avenues lead away, with single rows of stones to the east, south and west, and a double row just east of north. Had all the rows been completed, their axial alignments would have converged at the centre stone. The Stone is all local Lewissean gneiss. Inside the circle are the remains of a chambered round cairn of Neolithic type, within which human bones were found, this is commonly suggested to have been a secondary feature. The stones were buried in peat up to about 5 ft high before they were cleared in the year 1857. Professor Alexander Thom finds that looking south along the line of the stone avenue gives the point at which midsummer full moon sets behind Clisham. Also running from the circle are single lines of stones to the east (4 stones), west (4) and south (6). In plan, the site has the form of a cross. Running north from the stone circle are two parallel lines of stones forming an avenue about 80 metres long. There are now 19 stones in the avenue. Any visitor entering the site from the north will feel impelled to walk up this avenue to the circle, although this is now discouraged. More recently researchers have suggested that the avenue should be viewed as pointing south, to the position of the setting southern moon at the major standstill, though the horizon is blocked by the rocky knoll to the south of the site. The southern line of stones together with the large monolith in the centre of the circle has a bearing of 180.1°, and is an accurate indicator of the meridian, true north-south. Such a line indicates to the north the 'pole' around which the stars of the night sky appear to revolve, and to the south the highest position the sun and moon attain in the sky on any day. Callanish I is just one of over twenty megalithic sites on Lewis. The stones are intricately connected to the landscape, as with many megalithic ceremonial complexes. in the case of Callanish I, the stones share an intimate relationship with both the range of hills known as the 'sleeping beauty' or the 'old woman of the moors'. 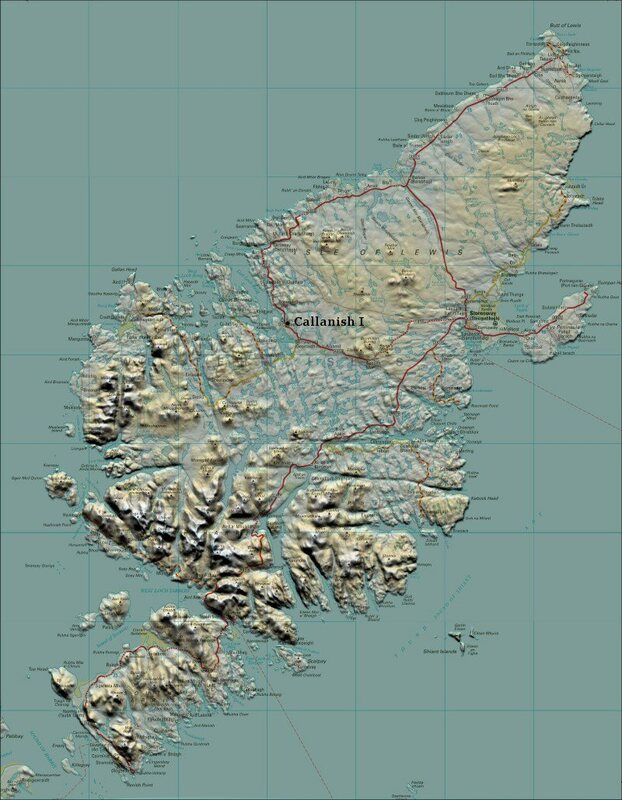 When the moon reaches it's southern extreme each 18.6 years it is seen to rise from behind the sacred hill range and skim the horizon for four hours till it gently sets again behind the Harris hills. This range of hills are as much a part of the monuments as the stones themselves. The central stone bears a strong similarity to those on the Orkneys. The relationship between the stones and the landscape can be seen to have been an important consideration to the builders, in Scotland and beyond. This is especially the case with the larger civil-scale ceremonial complexes of western Europe. The Callanish stones are situated at latitude 58° 12' north, which is exactly the right latitude for picking up the lunar standstills at their most southerly positions against the hills on the horizon, an event which only happens once each 18.6 years. It is worth pointing out too that at this latitude during the major lunar standstills north the Moon hardly sets, an observation which is echoed in Diodorus' famous text concerning the Temple of Apollo on the Isle of the Hyperborean's. 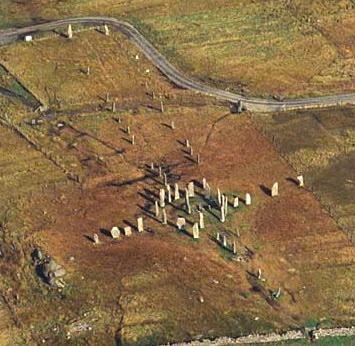 Extract: Aubrey Burl's revised 'Stone Circles of Britain, Ireland and Brittany'. 'As soon as I read about Apollo skimming the earth I knew this couldn't be Stonehenge, because at Stonehenge's latitude both the sun and the moon are always very high above the horizon. To see that phenomenon (the moon or sun hardly rising above the horizon between rising and setting) you have to go about 500 miles further north, and I wondered if Diodorus might have been referring to Callanish. Then Diodorus goes on to say: 'In that temple, at the rising of the Pleiades, the sun is seen to set at the equinox'. And those two phenomena do also occur uniquely at Callanish. The ENE stone row at Callanish was in line with the rising of the Pleiades in the early Bronze Age, and the western stone row does point towards the setting of the sun at the equinox. So three independent lines of astronomical evidence point to Callanish; and that is very convincing. It is accepted that Diodorus took his information about Britain from the earlier, lost, writer Hecataeus of Abdera, who himself drew on the lost writings of the 4th century BC Greek explorer Pytheas. Now what is remarkable is that by the time Pytheas got to Callanish, the Pleiades would have risen a few degrees to the north-east of the ENE stone row. The Pleiades - whose movements can be dated - had risen in alignment with the row for a few centuries after about 1700 BC (which is presumably when the row was built), but since then had edged away. So Pytheas seems to have been reporting a folk memory of the connection between the circle and the Pleiades that had survived at Callanish for at least 1,000 years, long after the circle had gone out of use. This may seem incredible but we know from other societies that oral traditions can survive for many, many centuries even though their original use has long since been abandoned. Strangely enough, years later when I wrote a book about stone rows, I suggested - quite independently of Callanish - that short stone rows (the type found at Callanish) were erected about 1800-1500 BC. And there you go, the Pleiades are rising at Callanish right in the middle of that range'. Much work has been done over the last 80 years on the astronomical orientations built in to the monument at Callanish, some of which are still controversial. Boyle Somerville suggested in 1913 that the northern avenue was positioned to indicate the rising of the star Capella about 3,800 B.P. He pointed out that the west row indicates the setting sun at the two equinoxes. He also suggested that a line between the two stones outside the circle (to the north-east and south-west) indicated the moon at its maximum (major standstill). This was the first time a surveyor introduced evidence for a lunar line for any prehistoric site in Scotland. Callanish: It's place on prehistoric Britain's geodetic map. Callanish is connected through geometry to other important British megalithic sites. It is curious fact that several of the most prominent British megaliths are also related to each other through 'geodesy', a statement which makes the blood run cold in mainstream historians. However, whether through accident or design, it is a fact that Callanish is situated exactly 5° North and 5° West of Arbor low, which is said to be a 'centre of ley-activity', and which in turn can be seen to be related through exact degrees to some of the most important megaliths in England. Callanish sits 5° North of Arbor Low, and 5° West..
Callanish (58° 12' N, 6° 45' W). Arbor-Low is in turn related to several other significant prehistoric monuments, revealing the possibility that certain sites may have been located according to a working knowledge of both latitude (calculated on the altitude of the pole-star for example) and more importantly, longitude - which is notoriously difficult and the cause of resistance to such ideas. 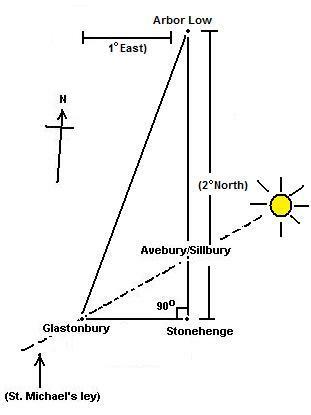 Arbor Low is positioned exactly 1° East of Glastonbury Tor and 2° North. Glastonbury Tor (51° 09' N, 2° 45' W). 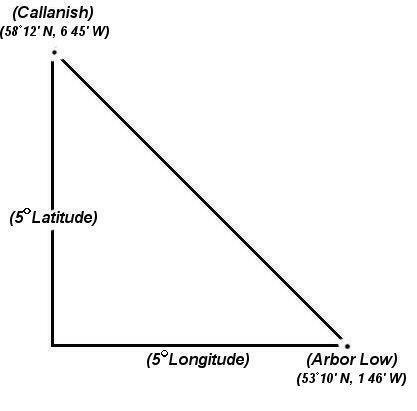 This means that Callanish lies 7° North of Glastonbury and 4° West. A tradition still current in the twentieth century called for all the fires on the island of Lewis to be extinguished on My first (Beltane). Priest's then started a new ire and distribute it to any people within the circle. This suggests an association with the sun-god Baal (Bel). Other traditions explain the presence of these stones by saying that when giants of old who then lived on the island refused to be Christianised, St.Kieran turned them to stone. Another local belief of this Gaelic-speaking community was that when the sun rose on midsummer morn, the 'shining one' walked along the stone avenue, his arrival heralded by the cuckoo's call. This could be a remnant of the astronomical significance of the Callanish stones. 1). Armit, I. Scotland's Hidden History. (1998). Tempus.